"My final decision is that the universe is just like a tree, with roots upwards. Just as a tree has branches and leaves, so the universe is also composed of planets which are fixed up in the tree like the leaves flowers, fruits etc." This quotation is from a letter from Srila Prabhapada to Svarupa Damodara dasa on April 27th 1076, quoted from 'Vedic Cosmography and Astronomy' by Richard L. Thompson published in 1989. Here we have an idea, originating in the Vedas, that the cosmos is akin to an inverted tree. If this is right then it is perhaps also right to see Iggdrasil as an inverted tree too. 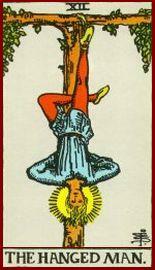 The Tarot Card of The Hanged Man suggests Woden hanging upside-down on the Irminsul. When we consider that The Hanged Man of the Tarot is most likely based upon Woden hanging on Yggdrasil and peering downwards thus gaining the Rune-Staves for his Folk, this fits in perfectly. Indeed, we are thus concerning ourselves with the concept of the Spinal Column (which we refer to as 'Me-Ru') being Iggdrasil which is an inverted tree whose roots reach into the heavens and whose branches reach down to the earth. We can thus see that this is the polar opposite to what we expect in the physical world - we are entering another parallel world here. The sequence of runes would thus be as I have suggested in articles in the past, the runes moving downwards along the spinal column. The 24 segments of the Spinal Column moving downwards - Feoh, Ur, Thorn, Os, Rad, Ken, Gyfu, Wyn, Haegl, Nyd, Is, Ger, Eoh, Peorth, Eolhs, Sigel, Tir, Beorc, Eh, Mann, Lagu, Ing, Daeg, Edel. The five fused vertebrae making the Sacrum - Ac, Aesc, Yr, Ior, Ear. The four fused vertebrae making the Coccxy - Cweorth, Calc, Stan, Gar. The World Tree and the Sacred Mountain are interchangeable symbols, and just as the tree is inverted, so is the mountain. Indeed, this is how Mount Meru/Sumeru is shown in some instances. In the first sequence we have the Oak, the Ash, and the Yew tree with Ior as the Serpent and Ear the Eagle (*), thus having links to Yggdrasil, where the Serpent is at the base, and the Eagle in the branches. In the second sequence we have the Four Hallows - Sword, Cup, Stone & Spear - but we also have the hidden runic message "White Stone" (Calc-Stan) at the centre. We should note that the White Stone of Ing has the meaning 'Gift of Ing - Fire' and it is thus interesting to note that in the last sequence we have the Gar-Rune which represents Gungnir - the Gift of Ing. Cweorth is the Flaming Sword wielded by the Last Avatar. (*) Taking Hamasson's ideas on this rune. Iggdrasil can be seen as interchangeable with the Sacred Mountain which lies on the White Island. This can be seen in the map below, which shows the existence of Thule-Hyperborea which stood in the far north before the catastrophe that sank it. The Gar-Rune, as I have suggested before, seems to symbolise the Sacred Mountain and the Four Sacred Rivers branching out from it. The statements suggest that at one time the lands were flat (suggesting a 'Flat Earth') but with the sinking of At-al-land (Numenor is named Atalante by Tolkien). the Earth became round. This statement would seem ridiculous, but when reading Vedic Cosmography and Astronomy a clearer view comes to light. I am here going to briefly go through this since it is important in view of the latest argument between those supporting a 'Round Earth' and those supporting a 'Flat Earth'. Indeed, anyone involved in this might well get hold of this book since it synthesises both ideas, showing that both are right (in one sense) and both are wrong (in another sense) - I will explain. 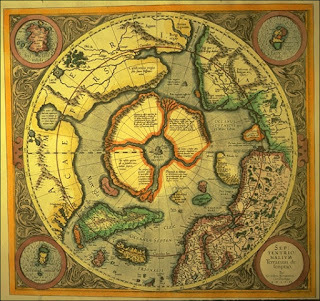 Looking at this legend again I feel that the only way that we can explain away the sinking of Thule-Hyperborea (the first era) and that no remnants can be found is that the whole continent moved into a different dimension. To explain the obvious discrepancies in the Vedas, the outlandish numbers and the enormous height of Mount Meru which cannot exist on this Earth we have to consider that there is another dimension which they exist, separated from this one. This is the reason why the Vedas contain references to a Bhu Mandala and why the Earth is portrayed as being flat in such mandalas. What we have here is the idea that in ancient time there was a higher state of consciousness open to certain Higher Beings (Rishis or Divine Beings) in which they saw the Earth in a different way than our physical senses see it today. We see the Earth as round (which it is in our consciousness) but they could see it in a higher state of consciousness in which the worlds appeared as flat and in 'layers'. (I am here reminded of the term used in Norse Mythology - Orlog - which can mean Primal Layers.) This is the theme of the book mentioned here, and it reconciles the contradictions in the Vedas. So when we say that Thule-Hyperborea 'moved into a different dimension' it is the same as saying that human consciousness lost the ability to see it, humans (in the main) being locked into the physical world, unable to gain access to higher states of consciousness and to higher worlds. The 'veils' between these worlds sometimes opened and some people could gain access to them - to the worlds of gods, elves, dwarves, joten etc. This brings us to another interesting concept from this book; in ancient myths these higher realms were projected onto our three-dimensional level. The only explanation for this is that they can also exist at a three-dimensional level. In easy terms to understand there are locations on Earth where access can be gained to these other dimensions, where higher states of consciousness can access these higher worlds - we know them as 'ancient sites' such as stone circles, cromlechs, barrows and such places as the Long Man of Wilmington and Woden's Barrow in Wiltshire, which are 'gateways' to other worlds. At such places higher realms can run parallel to their three-dimensional spots upon this Earth. Our own Wodenic Cosmology thus postulates a White Island in the centre of a Circular Ocean in the centre of which is a White Mountain from which run Four Sacred Rivers. The whole mandala makes up a White Tree with the Rainbow Bridge (Seven Chakras) connecting the worlds together. This is our 'Flat Earth' which exists in a higher dimension, and this is accessed only by those allowed to go on the Straight Way. All of this explains why established scholars cannot find any evidence of much of our mythology and legend, since it does not exist in our dimension, or in our world, but in a parallel dimension or parallel world - what is sometimes called the Inner Earth. The world of matter is obviously corrupted and is dying, in need of a renewal and a destruction to rebirth. Whilst all is corrupted, rotten and decaying, there lies a perfect world as it was in the Golden Age running parallel to our dying world. There Baldaeg the Beautiful awaits his return, this being Odainsacre in Norse Mythology, the place where no evil can enter, and where peace and harmony reign. When we get to the Gar-Rune we reach the Sacred Mountain (Mount Su-Me-Ru) which is the Sacred Centre from which the 'otherworld' can be seen by those who are deemed fit to do so. The 33 runes are the only rune-row to take us through the whole of the spinal column (Mount Su-Me-Ru) and the only one to feature the Sacred Mountain at the base (head really, since we are working upside-down). And the formula A-L-U is thus not 'inverted' as such since it is the 'right way up' when we find that the Sacred Tree itself is 'inverted'. All of what we have been doing is now fitting into place with the knowledge that Iggdrasil is the 'Inverted Tree'. The Sacred Tree features no less than three times in the last AEttir of the Futhork - Ac (Oak), AEsc (Ash) and Yr (Yew) - which cannot be a coincidence (although Yr is really 'Yew-Bow' rather than the actual tree). 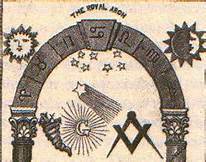 We also have (as stated before) the World Serpent (Ior) and the World Eagle (Ear) within the same AEttir. Indeed, these all come together in one group which is equivalent to the Sacrum (Sacral Area). Below these is the Coccyx made up of the last four runes - Cweorth, Calc, Stan, Gar - the Four Hallows or Graal Runes. The Sacrum is shaped like an inverted triangle which is very interesting since the symbolism we used for this area is just that - an inverted triangle. The Coccyx is the 'tail-bone' and is shaped like a tail, which suggests that giving 'The Devil' (i.e. Woden portrayed by the Judaeo-Christians as the 'Evil One') a tail may be more symbolism than reality. It is also interesting to note that in the Vedas and other works that follow them the Sacred Mountain is most often seen as being upside-down. If we symbolise the mountain as a triangle the inverted triangle fits nicely. We should also note that the Left-Hand Path (Way of the Hero) uses the technique of a reversal of values, just as postulated by Friedrich Nietzsche. This would seem to explain the widdershins dance of the witches, and the idea that 'Satanists' used the 'Lord's Prayer' but spoken in reverse. All of this suggests that the downward movement of the runes along the spinal column is right, and that Feoh starts at the Crown, and Gar is the last rune at the base, representing the Sacred Mountain. The Yule Tree ('Christmas Tree') has the obvious symbolism of the World Tree on which are the planets and stars (round balls and the lights twinkling) which lie in the branches. Of course, this is all upright, but somewhere I have read (not sure where) that certain shamanic societies used an inverted tree to symbolise the World Tree. If we look at the shape of the tree it is not unlike a triangle with the apex as the upper point. There are two runes which could link to this idea - the Germanic Ing-Rune and the Daeg-Rune (turned sideways). The Simarillion - J.R.R. Tolkien. The above statement suggests that the mythical Golden Age and its structure exist as they have always been, but in another world that can be accessed only by those chosen to do so. To get there the Straight Way has to be taken, rather than taking the curvature of the world as we see it today in our normal state of consciousness. The runes have always been written as straight lines and perhaps this is not just because they were carved in wood and stone, but perhaps reflecting this message to take the Straight Way. Nature builds in curves, and yet we have the Ley-Lines which again run in straight lines. These, we know, connect ancient sites deemed holy to our ancestors, sites that could be areas where two worlds run together, and where doorways to other worlds lie. It cannot be a coincidence that the White Stone of Ing can be found in England, and that within the Futhork can be found the message 'White Stone'. The central rune (Ken) in its alternative version, with the added 'cross' is very similar to the symbolism of The Hanged Man who hangs as a Cross over a Triangle. This is what can be seen on the Stone of Ing. We also have the message Gift of Ing on the stone, which is the meaning of the Gar-Rune, symbolic of the Sacred Centre. In a previous post on this blog I worked upon the idea of the Gar-Rune as the Sacred Mountain; this came about through looking at the top of an Egyptian Pyramid of glass, which showed clearly the Gar-Rune symbolism. We are thus faced with the possibility that the Great Pyramid is the top of what we could see as the Germanic Ing-Rune, with its reflection below it. That is, the Great Pyramid is the 'gateway' to another world. If I am right then maybe the idea of the secrets of Atlantis being hidden below this is right, but maybe these secrets do not lie in the physical world at all. Maybe this is why no-one will find them, since they exist in another world running parallel to ours, but a world that has an 'entrance' for those with the key to enter. This explanation could also help us to understand the symbolism used in certain legends connected to certain sites, such as the 'burial of treasure' (never found) or the burial of a 'Golden Knight' (again never found). Maybe these are the 'keys' to gaining entrance to these realms. If so then we have to look at these legends again with different eyes. The Steed of Woden is Sleipnir who has eight legs, four of which are used to travel in our world, and four to travel in other worlds. I recall distinctly connecting the Hale-Bopp Comet with Sleipnir, which suggests that this may not have been quite as it seems. It did stand in one place for several weeks before it disappeared totally - in the area of the Beorc-Rune in the Northern Skies. 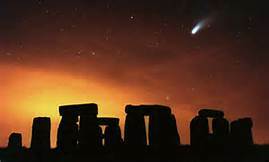 I have suggested in a previous post that this may not have been quite 'of this world' and that its being 'sent by Morgana' may hold the key to the mystery of the Great Comet, and also why it appeared around 4,000 years ago at the time of the final sinking of At-al-land. The letter 'G' has a meaning unknown to me, but the symbolism seems to suggest a solar meaning, with the 'rays' coming from it. 'G' is the seventh letter, for what that is worth. Travel between the worlds was known by the ancients, who seem to have been able to do so through the power of altered states of consciousness (as can be done today by some). But travel was also done by the use of the Vimanas which seem to be not unlike our UFO's today. These seem to travel in a way that defies our physical science and consciousness, but which could be explained if they entered and left our world (dimension) and thus used laws not of our world. In order to understand these different states of consciousness, different worlds or dimensions, the keys to gaining access to these worlds, and that the contradictions between a 'Round Earth' and a 'Flat Earth' can be reconciled through an understanding of different states of consciousness, we have to revive the most ancient Aryan Science and reject the Judaic Science which has locked us into the physical world and lost us access to other worlds. This seems to start with Quantum Science. Iggdrasil is also the White Tree which symbolises the White Race; it is shaken, battered near to total destruction (as the White Race is today) but it will be renewed after Ragnarok. It is the Fires of Black Surt that will destroy the worlds, but these fires also renew the worlds. Black Surt is the destroyer just as Sankarsana destroys the Three Worlds in Indian Lore, the latter also coming from the South. Sankarsana is also the 'king of eternal bliss', so we should not see Surt as an 'evil' being. Indeed there is a link between the Cweorth-Rune and Surt, since an alternative name for the rune is 'Tris' which is SIRT backwards. Cweorth is the Flaming Sword which is the weapon of Kalki and of Surt. We need to consider the alternative symbolism to the World Tree and that is the World Mill. This can be seen as three concentric circles or 'millwheels' turning around a central axis. The force behind this turning process is Waendal or Mundilfore. Thus the Three Worlds of Asgard-Midgard-Hel turn around a Central Axis (Cosmic Pillar). In the Vedas we have the symbolism of the 'Churning of the Milky Ocean' where we find a tortoise, a central churn, and a serpent being pulled in opposite directions by the Devas (Gods) and Asuras (Demons). This can also be found in the Maya Codex Tro-Cortesianus from the Mayan era. The 'churn' would be linked to the quern and thus to the Cweorth-Rune. Indeed, this rune is the Fire-Twirl. The movement of the World Mill would thus be akin to the Nyd-Rune where the Need-Fire is produced by a forward-backward movement, a movement suggesting the conflict of opposites which sustains the movement itself. This movement, it must be noted, creates fire by friction. This is the realm of Agni (Inga) who we see being our Hama/Heimdall, the Son of Waendal or Mundilfore. His 'father' is the Turner of the Mill-Wheel, and he sends his 'Son' down to us as an Avatar. Hama is a projection of Waendal. (Waendal is. of course, the Long Man of Wilmington and is also the Guardian of the Gateway to the Gods). The Hagal-Rune (Snowflake) can be seen as the four directions that radiate from a Central Axis (an upright stave). This can also be seen as a mandala of the Flat Earth (four directions) with the Pole Star at the top (North) and the South Star at the base (South). Thus the rune is one of wholeness and of the heildom. The Nyd-Rune is symbolic of the Sword in the Oak-Tree, the Sword plunged there by Woden and taken out by Sigmund the Wolsunga. The tree thus represents the Cosmos, from which this Sacred Sword is removed. It can only be taken out by a 'Son of Woden', and when his time has come it is Woden that breaks the Sword with the Spear Gungnir. This Sword is then re-forged by Sigurd the Wolsunga who slays the Dragon that guards the Gold Hoard (this has various levels of meaning, not least that he slays those who guard the 'Gold Hoard' for real). The Primal Time or 'First Time' is the key to understanding the concept of the Iggdrasil Mandala and the Sinking of Thule-Hyperborea. This is referred to in Norse Mythology as Ar Var Alda - The Primal Time or Old Time. The key to this is the revival of an Aryan Science based upon the concept of Implosive Science as postulated by Miguel Serrano. This is symbolised by the Black Sun whose rays move inwards towards the Sacred Centre. The Sig-Runes are reversed because it is symbolic of this inward-movement. The above crop-formation shows the Black Sun with the Lightning-Flashes being as the normal Sig-Rune. At the centre is a 12-spoked wheel. The later 'Black Sun Crop-formation' appeared as the normal Black Sun, but with some subtle changes (not the subject of this post). The Black Sun is the source of the Universal Energy, the Vril or Odic Force, or whatever name we wish to call it. This may well be the Dark Energy or Dark Matter mentioned by scientists, although this may also be something different, the subject of future research. After the sinking of Thule-Hyperborea and then At-al-land, certain Aryan Adepts travelled across the world teaching the remnants of the catastrophes the Old Sciences which were being lost. We see these in the Shemsu Heru or 'Followers of Horus' in Egypt, the Seven Rishis of India, and maybe even the Seven Sons of Mimir in Norse Mythology, who arise prior to Ragnarok at the End-Time. These were the White Gods who travelled to different areas teaching the remnants of the various races an advanced science, which has come down to us only as 'myth' and 'legend'. Our task today is to preserve the Ancient Wisdom through a knowledge of Iggdrasil (Cosmic Lore) and through the Ancient Runes, discovered by Woden as he hung upon the Wolf-Tree. Woden is the High God, hence the reason we find that he sacrificed 'himself to himself'. He hung upon the Cosmic Tree (Cosmos) in order to gain the knowledge of the runes, which could only be done in a higher state of consciousness - hence the Shamanic Rite. The Ur-Rune which suggests the realm of the Primal Time. The ur-glyphic Irminsul whose form is the WAN-WIL-WEH of the Milky Way, our galaxy. This rune thus suggests the primal form of our galaxy - the Ur-Type. It is also the Yew-Bow or Yew-Tree where the source of the Yew-Bow stems. The Yew is an evergreen tree with needles, something applied to Iggdrasil as the 'Needle-Ash'. The Eoh-Rune or Ehwaz-Rune is itself the Yew-Tree, but its name stems from the Life-Force or Universal Force. As Iormungand the serpent biting its tail represents the centripetal force of attraction, contraction and implosion. As Ear the eagle represents the centrifugal force of repulsion, expansion and explosion. The Oak - strength, durability, toughness, virility (the acorn is a 'phallic' symbol, and also the 'seed of creation'). The Ash - uprightness, steadfast since even when cut down it regenerates and 'coppices' itself easily, it reproduces abundantly, somewhat like a 'weed' through the keys being sent miles by the winds. The Yew - as an evergreen tree it is 'eternal', indeed its name and the Eoh-Rune are linked to the idea of 'eternity' and 'everlasting'. Some species actually regenerate from inside as the outer tree dies, it is thus associated with Eternal Life or Immortality. In regard to the last four Graal Runes this would be the subject of a future post, but since the sequence Cweorth-Calc-Stan-Gar is centred around the Calc-Stan runes which suggest 'White Stone', then we are faced with the idea that somewhere here is a link to the White Stone of Ing. It is also likely that both the names Ing and Igg are the same, and that Iggdrasil is the 'Steed of Ing' who is an ancient form of Woden - the 'Terrible One'. The Three Sacred Trees - Oak-Ash-Yew. The Serpent at the base of the Tree. The Eagle at the top of the Tree. The Four Hallows or Graal-Runes - Sword-Cup-Stone-Spear. It must be remembered that the Four Hallows are remembered in Irish Myth as the four sacred objects of the Tuatha de Danaan. These were brought from another world and did not originate here on Earth. The secret of these objects lies in the White Stone whence 'him that overcometh' will eat of the fruit of the 'Tree of Life' (immortality). The transformation will be achieved through the awakening of the Inga-Fire - 'Gift of Ing'. Note: I feel that it is important to recognise that certain areas of our land are situated in such a position that the same area also exists at a higher dimensional level. This infers that access can be gained at these areas, access to certain areas within these other worlds.